This application is divided from our European Patent Application No. 09700876.7 . This application relates to laser surgery techniques and systems for operating on eyes. Laser light can be used to perform surgical operations on various parts of an eye for vision correction and other medical treatment. Techniques for performing such procedures with higher efficiency may provide desired benefits. For example, document WO 2007 084 602 describes a laser ophthalmic system system adapted to cut eye lens material into cubes that can be subsequently aspirated and removed. A grid of cut can be created to fragment the lens. Alternatively, lens material optical properties may be modified by creating shell-shaped cuts following local curvature of the lens without removing any lens material. A laser surgical system for fragmenting lens tissue of an eye is provided the system comprising: a pulsed laser adapted to generate a pulsed laser beam; an optics module comprising one or more lenses and reflectors adapted to focus and direct the laser beam towards a target region in the lens tissue; and an imaging device adapted to collect reflected or scattered light or sound from the target region in the lens tissue to capture image data. The system further comprises a control module adapted to generate a laser control signal to control the pulsed laser and generate a beam control signal to control the optics module to adjust the focusing and the laser beam direction in response to the beam control signal. The control module is adapted to process the captured image data to determine the placement of the applied laser pulses; and to control the optics module to scan the pulsed laser to form a regular array of cells in a volume of the target region located in the lens by creating layers of laser-induced photodisrupted bubbles to generate cell boundaries such that curved layers of photodisrupted bubbles are created to accommodate a natural curvature in the target region in the lens tissue of the eye, thereby breaking up the tissue along surfaces and boundaries of the cells into granules of fragmented tissue for removal via aspiration. In some implementations the forming the cells includes scanning the laser beam to form a cell array progressing from a posterior to an anterior direction, or scanning the laser beam to form a cell array progressing from an anterior to a posterior direction. In some implementations the directing the beam of laser pulses includes applying the laser pulses with a laser parameter of at least one of: a pulse duration between 0.01 picosecond and 50 picoseconds, a repetition rate between 10 kiloHertz and 100 megaHertz, a pulse energy between 1 microJoule and 25 microJoule, and a pulse target separation between 0.1 micron and 50 microns. In some implementations the directing the beam of laser pulses comprises applying the laser pulses with a laser parameter based on a preoperative measurement of structural properties of the target region of the tissue, or an age dependent algorithm. In some implementations the method also includes applying additional laser pulses to one or more locations outside the target region of the tissue to create an opening for an additional procedure. In some implementations the laser control module formed to generate the laser pulses with laser parameters of at least one of: a pulse duration between 0.01 and 50 picoseconds, a repetition rate between 10 kHz and 100 megahertz, a pulse energy between 1 microJoule and 25 microJoule, and a pulse target separation between 0.1 micron and 50 microns. The invention is defined in the claims, other embodiments being merely exemplary. FIGS, 1a-c illustrate a volumetric eye disruption procedure. FIG. 2 illustrates an aspiration step. FIG. 3 illustrates an ophthalmic surgery system. FIGS. 4a-b illustrate a regular cell array. FIGS. 5a-d illustrate a layer-by-layer formation of a cell array. FIGS. 6a-b illustrate a formation of a cell array on a cell-by -cell basis. FIGS. 7a-c illustrate spherical and polyhedral cell structures. This application describes examples and implementations of techniques and systems for laser surgery on the crystalline lens via photodisruption caused by laser pulses. Various lens surgical procedures for removal of the crystalline lens utilize various techniques to break up the lens into small fragments that can be removed from the eye through small incisions. These procedures may use manual mechanical instruments, ultrasound, heated fluids or lasers and tend to have significant drawbacks, including the need to enter the eye with probes in order to accomplish the fragmentation, and the limited precision associated with such lens fragmentation techniques. Photodisruptive laser technology can deliver laser pulses into the lens to optically fragment the lens without the insertion of a probe and thus can offer the potential for lens removal with improved control and efficiency. Laser-induced photodisruption has been widely used in laser ophthalmic surgery. In particular, Nd: YAG lasers have been frequently used as the laser sources, including lens fragmentation via laser induced photodisruption. In a laser-induced lens fragmentation process, laser pulses interact with the lens tissue to generate gas in form of cavitation bubbles and decrease the lens tissue transparency. Because the laser pulses are sequentially delivered into the lens, the cavitation bubbles and reduced lens tissue transparency caused by the initial laser pulses can obscure the optical path of subsequent laser pulses and thus can interfere with the delivery of subsequent laser pulses directed to additional target positions in the lens by blocking, attenuating or scattering the subsequent laser pulses. This effect can reduce the actual optical power level of the subsequent laser pulses and thus adversely affect fragmentation at the deeper locations in the lens. Some known laser-induced lens fragmentation processes do not provide effective solutions to address this technical issue. Based on effects of distinct regional properties of the lens and laser pulse parameters on spreading of gas produced during photodisruption, techniques, apparatus and systems described in this application can be used to effectively fragment the crystalline lens to remove a portion of or the entirety of the lens by using photodisruptive laser pulses with reduced interference caused by laser-induced air bubbles in the eye during the photodisruption process. The present methods and apparatus allow fragmentation of the entire or significant portions of the crystalline lens utilizing a photodisruptive laser delivered with minimized interference from gas generated during photodisruption. In addition to reduced gas generation the method allows the use of significantly less total laser energy to treat the eye and reduces potential undesired effects such as heat generated by the laser and reduces overall procedure time. The removal of a portion of or the entirety of the crystalline lens can be achieved via aspiration with reduced or no need of other lens fragmentation or modification modalities. The crystalline lens has multiple optical functions in the eye, including preservation of a transparent optical path and dynamic focusing capability. The lens is a unique tissue in the human body in that it continues to grow in size during gestation, after birth and throughout life. Since new lens fiber cells are added from a germinal center located on the equatorial periphery of the lens, the oldest lens fibers are located centrally in the lens. This region, called the lens nucleus, has been further subdivided into embryonal, fetal and adult nuclear zones. While the lens increases in diameter, it may also undergo compaction so that the properties of the nucleus are different from the cortex (Freel et al BMC Ophthalmology 2003, 3:1). In addition, since lens fiber cells undergo progressive loss of cytoplasmic elements and since there is no blood supply or lymphatics to supply the inner zone of the lens, it becomes progressively more difficult to preserve the optical clarity and other properties (e.g., lens flexibility) that serve the function of the lens. Of particular importance is the central core of the lens, occupying the inner approximately 6-8 mm in equatorial diameter and approximately 2-3.5 mm in axial diameter. This region has been shown to have reduced permeability to and from the metabolically active cortex and outer nucleus (Sweeney et al Exp Eye res, 1998:67, 587-95). A correlation with this observation is the progressive loss of transparency that is identified in the most common type of cataract in the same region in patients, as well as increases in lens stiffness that occur with age in a gradient fashion from the peripheral to central portion of the lens (Heys et al Molecular Vision 2004: 10:956-63). One result of such changes is the development of presbyopia and cataract that increase in severity and incidence with age. The above identification of a central zone with different transport, optical and biomechanical properties has significant implications for fragmentation techniques with photodisruption, because one significant limitation to various laser-based lens fragmentation techniques is the uncontrolled spread of gas bubbles that can occur during photodisruption that can reduce the effectiveness of subsequent laser pulses in interacting with the lens. The layered structure of the lens body at different locations exhibits differing resistance to spread of cavitation bubble gas. Additionally, the softer peripheral layers can be sufficiently soft so as not to require photodisruption and/or significant fragmentation prior to aspiration and removal. These softer, less resistant peripheral layers however can allow the gas generated by photodisruption to spread and block subsequent laser pulses that are directed to fragment the harder central core. The precise determination of regions of a lens that are more or less resistant to the spread of cavitation bubble gas depends on individual characteristics of each patient including the age of the patient. The spread of gas can also be influenced by the particular laser parameters and treatment pattern applied to the target. The tissue of the lens can be treated in an essentially uniform fashion. FIGS,1a-c illustrate an example where a photodistruptive laser system is operated to place laser pulses essentially uniformly within a surgical region, e.g., the eye lens, to be treated to allow aspiration and removal of the lens material. One way to fill the volume with laser is to direct the laser pulses with a scanner to form a bubble layer and fill the entire volume with a multitude of layers, as shown in FIG. 1c. FIG. 2 illustrates that after the laser treatment, an aspiration device can be used to remove the disrupted lens material. In such procedures, the laser pulse characteristics, such as their duration can range from 0.01 picoseconds (ps) to 50 picoseconds. The laser pulse energy, layer, line and spot separations can be optimized to achieve the highest effectiveness of breaking up the tissue while minimizing the effects of gas spreading, laser exposure and procedure time. One determining factor of the laser pulse characteristics is the need to avoid or minimize a triggering of an uncontrolled gas spreading. Since the conditions and properties of the lenses can vary from patient to patient, the threshold laser pulse parameters to achieve this can vary as well. In some implementations, the laser energy per pulse can range from 1 micro Joule (µJ) to 25 µJ and the spatial pulse separation between two initial pulses adjacent in space can fall within the range of 0.1 micron to 50 microns. The laser pulse duration can range from 0.01 picoseconds to 50 picoseconds and the laser repetition rate from 10 kHz to 100 MHz. The parameters of the laser pulses and the scan pattern can be determined by various methods. For example, they can be based on a preoperative measurement of the lens optical or structural properties. The laser energy and the spot separation can also be selected based on a preoperative measurement of lens optical or structural properties and the use of an age-dependant algorithm. The pulsed laser is operated to direct a sequence of laser pulses to a target lens region of the lens to fragment the target lens region. The laser pulses may also be directed to one or more regions of the lens other than the target lens region, e.g., peripheral locations and/or the lens capsule, to create an opening or incision in the lens. After the desired fragmentation and incision are achieved, the laser pulses can be terminated and the fragmented target lens region and any other selected portions of the lens are removed from the lens body by aspiration. The following sections describe techniques and laser systems for applying laser pulses to surfaces and boundaries of cells of predetermined size, shape and spatial distribution that differ from the above described uniform volumetric distribution of the laser pulses within the treated volume. Following such a laser treatment the lens tissue can subsequently break up along the surfaces and boundaries of the cells. The size of the cells or granules can be determined to be small enough that they can easily be removed by using e.g. an aspiration device. A typical aspiration device is a needle attached to a suction pump. For example a 23 gauge needle has an inner diameter of 0.34 mm. Cells smaller than the inner diameter of the aspiration needle can pass through the needle without clogging. FIG. 3 illustrates a laser surgical system for performing such a non-uniform laser distribution process. An optics module 310 can focus and direct the laser beam to a target lens 301. The optics module 310 can include one or more lenses and may further include one or more reflectors. A control actuator can be included in the optics module 310 to adjust the focusing and the beam direction in response to a beam control signal. A system control module 320 can control both a pulsed laser 302 via a laser control signal and the optics module 310 via the beam control signal. An imaging device 330 may collect reflected or scattered light or sound from the target lens 301 to capture image data via the target lens 301. The captured image data can then be processed by the laser system control module 320 to determine the placement of the applied laser pulses. This control can be a dynamic alignment process during the surgical process to ensure that the laser beam is properly directed at each target position. The imaging device 330 can be implemented in various forms, including an optical coherent tomography (OCT) device. In other implementations, an ultrasound imaging device can also be used. The system control module 320 may process image data from the imaging device 330 that includes the position offset information for the photodisruption byproducts in the target region. Based on the offset information obtained from the image data, the beam control signal can be generated to control the optics module 310, which can adjust the laser beam in response. A digital processing unit can be included in the system control module 320 to perform various data processing functions for the laser alignment and laser surgery. The digital processing unit can be programmed to control the laser parameters of the initial laser pulses and the additional laser pulses, laser beam scanning direction from the posterior to anterior direction for the initial laser pulses and the laser movement of the additional laser pulses. In one implementation, the pulsed laser 302 can be a high repetition rate pulsed laser at a pulse repetition rate of thousands of shots per second or higher with relatively low energy per pulse. Such a laser can be operated to use relatively low energy per pulse to localize the tissue effect caused by laser-induced photodisruption. A form of this tissue effect is the formation of cavitation bubbles. In some implementations, the impacted tissue region can have a size of the order of microns or tens of microns. This localized tissue effect can improve the precision of the laser surgery and can be desirable in certain ophthalmic surgical procedures. In one example of such surgery, placement of many hundred, thousands or millions of contiguous or near contiguous pulses, which may be separated by microns or tens of microns, can be used to achieve certain desired surgical effect placement. Such procedures using high repetition rate pulsed lasers may require high precision in positioning each pulse in the target region during surgery, both regarding their absolute position with respect to a target location and their relative position with respect to preceding pulses. For example, in some cases, subsequent laser pulses may be required to be delivered next to each other with an accuracy of a few microns, when the time between pulses (the repetition rate) can be of the order of microseconds. FIGS. 4a-b show an implementation of an ophthalmic surgical procedure, during which laser spots (or bubbles) are generated to form granules, the granules themselves forming a granule array. The laser spots can be generated to form a regular spatial pattern of the granules, as shown in FIG. 4b. Regularly spaced granules utilize the laser pulses well, since they require a limited amount of laser energy to break up a target region. Nevertheless, in other implementations the granules may form an irregular or even random array. The cells can be packed next to one another. Creating the side wall of one cell can simultaneously create the side of the neighboring cell as well, making the process efficient. The design of the individual cells and the cell pattern may be selected based on the physical properties of the tissue to be treated. The bulk of the lens consists of concentric layers of elongated fiber cells. Cleavage of tissue parallel and perpendicular to the layers and individual fibers is different. Therefore, in some implementations a higher spot density and/or laser pulse energy can be used to form cell boundaries which are perpendicular to layers and fibers. During the formation of a particular spatial pattern, different implementations may utilize different scanning paths. A regular pattern can be built all at once or granule by granule. Which method to use may depend on the particular laser scanner and it is a matter of optimization to achieve higher precision and shorter procedure time. In a particular implementation the granules, or cells, can be cubes. With an analogy to crystal cell structures, this pattern of cells can be described as a Simple Cubic (SC) crystal. Layers of these cubes can be formed simultaneously, followed by repeating the procedure in subsequent layers. FIGS. 5a-d illustrate that in some implementations first a bubble layer can be generated with the laser pulses to form the bottom layer of the SC crystal, as shown in FIG. 5a. In some implementations, this bottom layer can be essentially transverse, or perpendicular, to an optical axis of the lens or the eye. As it is known, an optical axis can be defined in several different ways, with somewhat different outcomes. In what follows, the term "optical axis" will be used to refer to an axis defined by any one of these procedures, or even a compromise axis, defined as a direction falling between differently defined axes. FIG. 5b illustrates that subsequent to the formation of the bottom layer, a regular array of cell walls can be generated. These walls can be essentially parallel to the optical axis, formed with a predetermined cell height. FIGS. 5b and 5c illustrate that the scanner can raster, or sweep, first in one direction (FIG. 5b) then in an orthogonal direction (Fig. 5c). FIG. 5d illustrates that a layer of cells can be completed by placing a bubble- layer to form the top of the cells. This "top" bubble-layer can then form the bottom bubble- layer for the next layer of cells. The target volume can be filled up with a regular array of granules/cell by repeating the steps 5a-d. In some implementations, a smooth boundary layer can be formed around the regular array of cells in the surgical target region, partially, or in its entirety. Such a boundary layer can provide a smooth surface without the raggedness of the edges of the cell array. The layers themselves are curved, to accommodate the natural curvature of the lens target region itself. Such structures may not be entirely regular. They may contain deformations or lattice defects. These defects can be formed intentionally or may emerge during the creation of the cell array. FIGS. 6a-b illustrate an alternative implementation, where complete cells of a layer can be formed individually one after the other by controlling the scanner to form all walls of a single cell, and to start forming the next cell only after the previous cell is completed. FIG. 6a illustrates that rows of cells can be formed first to build a layer of cells. FIG. 6b illustrates that subsequent layers can be formed on top of already created layers, to fill a surgical target volume. The implementations which form the cells individually may have the following features. First, FIGS. 7a-c illustrate that the shape of the cells can be different from the simplest shapes, like cubes. For example, the cell array can have a hexagonal base to form a Simple Hexagonal (SH) lattice. Or a target volume can be broken up into cells of a different type, such as spheres (FIG. 7a), separated by complementary small interstitial regions. Spherical cell shapes can minimize the occurrence of clogging in the aspiration needle. The type of the lattice, formed by the spherical cells can be selected to optimize the ratio of the volume of the spheres to the volume of the interstitial regions. These lattice types are known as "close packed" crystals structures. Face Centered Cubic (FCC) and Hexagonal Closest Packing (HCP) are two such structures. In some implementations, the cells can have shapes which approximate spheres, such as polyhedral shapes. In these implementations, the polyhedral cells can form close packed structures, analogously to the lattice of spheres. FIG. 7b illustrates a Truncated Rhombic Dodecahedron, which is an example of a polyhedron approximating a sphere. FIG. 7c illustrates that truncated rhombic dodecahedrons can be close packed to form a layer, and fill a target volume with a stack of layers. When passing through the aspiration needle, these polyhedra can more readily roll than cubes and the likelihood of clogging is smaller. Second, the laser scanner pattern can be optimized to speed up completion of the whole pattern. Creating individual cells with sizes of the order of 100 to 200 micrometers require small scanner displacements and can be performed at higher scanner speed. Larger scale moves of the scanner can be slower. The design of the scanner can be optimized effectively for achieving the shortest overall procedure time. Applying a combination of two different scanner types, a fast small displacement scanner and a slow but larger displacement scanner, can further optimize system performance. Building cells individually is also consistent with modular software design practices. A complete volumetric pattern can be created from building blocks; cells, rows and layers of cells and finally the complete pattern. An analogous approach can be effective in constructing a software code for the scanner drivers as well. The above described or other patterns can be created by proceeding from the posterior to the anterior side of the lens or from the anterior to the posterior side. The former can be advantageous to avoid blocking the laser beam by bubbles previously formed in the target tissue. The latter may be preferable when a cataract is present in the lens and penetration of laser light through the cataract is already compromised. In that case fragmentation of the anterior portion of the lens may be necessary followed by aspiration of the treated portion and successive laser treatment and aspiration of the deeper-lying parts of the lens until the full volume is fragmented. Additional features of implementations which fragment the target tissue in a granular or cellular form include the following. 1) Reduction of the amount of gas bubbles formed in the eye and thus reduction of the induced opacity of the tissue. Since a similar degree of tissue disruption can be achieved by considerably smaller number of bubbles in a granular/cellular procedure, this aspect can increase the effectiveness of the laser treatment to a substantial degree. 2) Reduction of the number of pulses applied to the tissue, which increases the speed of the procedure. Time is at a premium during eye surgery, as after about two minutes patients sometimes develop an increasing, hard-to-control eye movement. This can necessitate the abandonment of the surgical procedure. Therefore, if a new feature in a surgical procedure is capable of reducing a time of the surgery from above two minutes to below two minutes, that feature may increase the utility of the surgical procedure qualitatively. 3) Reduction of the required total energy applied to the tissue, which reduces potential undesired side-effects related to the exposure of the eye to laser light. In most procedures, a substantial portion of the laser light passes through the surgical region and continues its way to the retina. The retina being a strongly light sensitive tissue itself, this transmitted surgical laser light may damage the retina to an undesirable or unacceptable degree. Thus, a reduction of the transmitted laser light can be an advantageous feature. To quantitatively assess the different implementations, a comparison is provided for the amount of laser energy required for treating a given volume, and for the number of laser pulses required for volumetric and cellular fragmentation procedures. Table 1 illustrates some results of the comparison, contrasting tissue breakdown by performing a volumetric method and by forming a Simple Cubic lattice of cells. Typically, the volume of an individual gas bubbles is approximately proportional to the energy of the femtosecond laser pulse which created the bubble. This proportionality holds for energies not too close to the threshold of producing plasma. Further, the individual pulses are directed such that the gas bubbles touch each other. In the volumetric method this translates to the spot, line, and layer separation being approximately equal to one another, all being set by the diameter of the bubbles. In the cellular implementation this translates to the cell boundaries being formed by touching spheres. It is noted that in practice, some overlap may be necessary for both volumetric and cell-array methods. Table 1 reports comparison results, varying the spot separation from 2 microns to 20 microns and the cell size from 50 microns to 300 microns. The speed of the procedure was characterized by the number of pulses needed for a given total volume and the total energy needed. In some implementations of the volumetric breakdown, the total energy needed to break down the tissue in the target region can be approximately independent of the size of the bubbles. This energy is of the order of 1 Joule per cubic millimeter of target volume. This relationship holds most accurately in the energy range in which the volume of an individual bubble is proportional to the laser pulse energy. For implementations which form a lattice of cells, the speed and the corresponding energy depends both on the size of the individual bubbles and on the size of the cell. The speed increases with increasing cell sizes and decreasing bubble sizes. This is the result of the change in the volume to surface ratio of the cells as a function of their size. This comparison is based on using a 23 gauge needle which has inner diameter of 340 micrometers. The largest size cube which can enter the tube at the least favored orientation, with its body diagonal perpendicular to the length of the tube, is about 196 micrometers. Actual implementations may use smaller grain sizes, such as 150 microns. As Table 1 illustrates, methods based on forming cell-lattices can exhibit an increase of speed by a factor of 2.9 to 25.3 over the speed of the volumetric method as the size of the bubbles is varied. For a typical bubble size of 10 microns, the increase of speed can be about 5.4-fold. The speed ratio increases with decreasing bubble size. The improvement in the procedure time is approximately a factor of 10 for 5 micron bubble size and 25 for 2 micron bubble sizes. These are quite significant improvements over the volumetric method. When the cell size is significantly larger than the bubble size, R can be approximately proportional to the Volume / Surface ratio of the cell. Since the volume of gas produced is approximately proportional to the product of the area of the cell boundaries multiplied with the bubble size, R is approximately proportional to a ratio of a cell size to a bubble size. R ∝ C e l l _ s i z e B u b b l e _ s i z e .
Granular fragmentation with the smallest bubble size produces the smallest amount of gas in the target tissue and uses the smallest amount of total laser energy. In some implementations there can be a practical limit, how small a bubble size should be used. In some implementations the bubbles are closely packed, and the corresponding spot separation and line separation is nearly equal to the bubble size when creating the surface of a cell boundary. Although the laser parameters, average power, pulse energy and repetition rate can be chosen over a wide enough range to achieve the desired bubble size, spot and line separations, the scanning system can be limited in its speed and acceleration to generate a particular pattern. To keep the acceleration of the scanner under control at turning points, in some implementations the linear speed of progression of the bubble placement can be kept smaller than a limiting value, vlim. 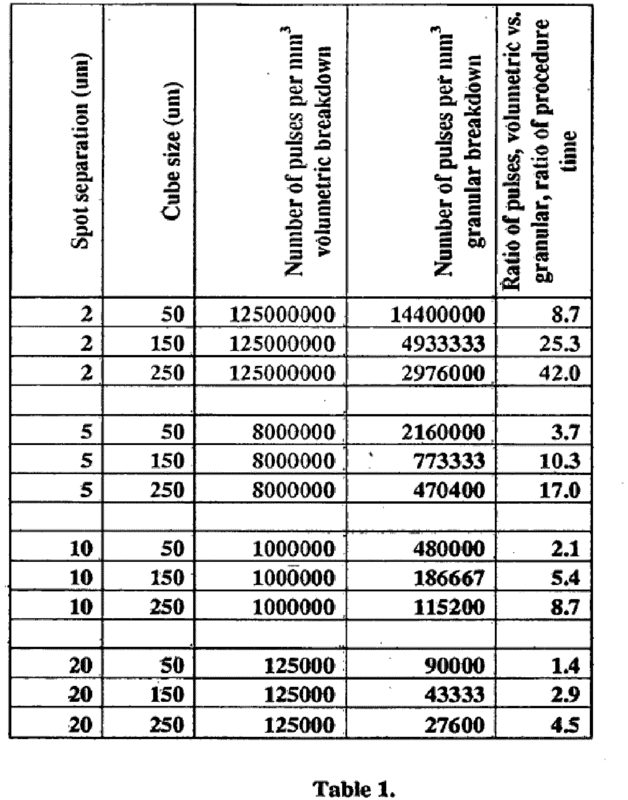 For a given granular pattern the total area of the cell boundaries, A, and as demonstrated in Table 1. the total number of pulses N per total volume are given for given bubble size. For example, for a close packed area A = N * bubble_size2. The total linear path of bubble placement s may equal N * bubble _size, which is also the speed of progression of bubble placement times the total procedure time, s = v * T. Therefore, in some approaches, the product v * T * bubble_size may be approximately constant. In order to minimize the total amount of gas produced and the total amount of laser energy used for a granular pattern, some approaches minimize the bubble size by selecting the linear speed of progression and the procedure time to their largest acceptable value vlim and Tmax. Here Tmax is the maximum procedure time tolerable by the clinical environment, less than 1 minute is acceptable, less than 30 seconds is desirable, dictated mainly by the tolerance of the patient to keep still during the procedure. On the other hand, to minimize procedure time, the highest linear speed v[iota],m and the largest acceptable bubble size can be selected. The largest acceptable bubble size is determined by the amount of gas produced, pulse energy used, and by the required precision of the surgery. Some implementations of the surgical system maximize the speed of scanner and lower the laser energy threshold for the formation of cavitation bubbles, in order to minimize bubble size. The surgeon has the choice to select particular parameters within the limitation of the surgical system to optimize the parameters for particular surgical outcomes. The decision may take into account the size of the surgically affected area, tissue parameters the age of the patient and other factors. a system control module (320) adapted to generate a laser control signal to control the pulsed laser (302) and generate a beam control signal to control the optics module (310) to adjust the focusing and the laser beam direction in response to the beam control signal; wherein the system control module (320) is adapted to process the captured image data to determine the placement of the applied laser pulses; characterised in that the system control module (320) is further adapted to control the optics module to scan the pulsed laser to form a regular array of cells in a volume of the target region located in the lens by creating layers of laser-induced photodisrupted bubbles to generate cell surfaces and boundaries such that curved layers of photodisrupted bubbles are created to accommodate a natural curvature in the target region in the lens tissue of the eye, thereby breaking up the tissue along surfaces and boundaries of the cells into granules of fragmented tissue for removal via aspiration. The system of claim 1, the system control module (320) being adapted to control the optics module to form a boundary layer around the regular array of cells. The system of claim 1, the system control module (320) being adapted to control the optics module to form the regular array of cells by forming the cells with a spatial extent less than 340 microns. The system of claim 1, wherein the photodisrupted bubbles are created by laser pulses separated by a distance of 20 microns. The system of claim 4, wherein the spatial extent of the cells is 250 microns or less. The system of claim 5, wherein the photodisrupted bubbles are created by laser pulses separated by a distance of 10 microns. The system of claim 6, wherein the photodisrupted bubbles are created by laser pulses separated by a distance of 5 microns. The system of claim 3, wherein the system control module (320) is further adapted to control the optics module to reduce a linear speed of progression of a bubble placement at turning points to be smaller than a limiting value. The system of any one of claims 1 to 8, wherein the imaging device (330) is an optical coherent tomography (OCT) device. The system of claim 1, wherein the system control module (320) is adapted to process image data from the imaging device (330) that includes position offset information for the photodisruption byproducts in the target region, and based on the offset information obtained from the image data, the beam control signal can be generated to control the optics module (310), which can adjust the laser beam in response. MXPA04011893A (en) * 2002-05-30 2005-03-31 Visx Inc "tracking torsional eye orientation and position".